‘ The clutch is producing a quiet but definite squeal when the clutch pedal is depressed. I set the two-stage pto adjuster nuts as per the manual/DVD and the pto engages correctly and stops as it should when the clutch is depressed. 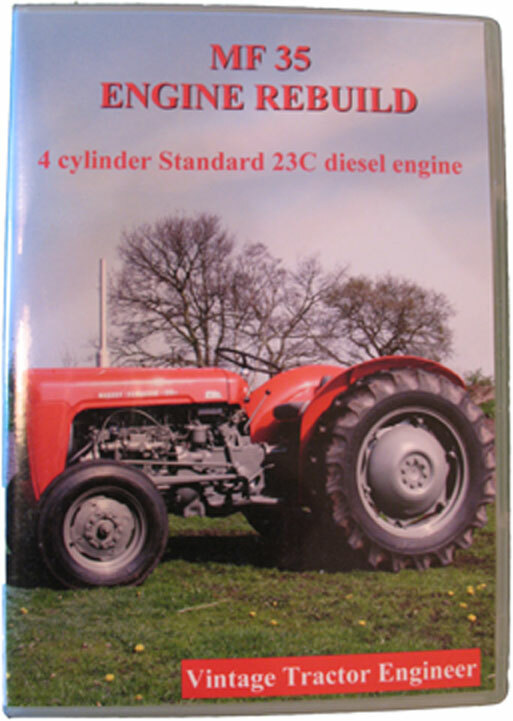 I can select all gears and the clutch does not slip- the tractor drives and stops perfectly. I installed new pilot and clutch release bearings as part of the clutch replacement and set the pedal freeplay as per the book. Despite this I can hear a squealing as soon as any weight is transferred onto the clutch pedal, the tone of the squeal changes slightly but does not stop as the pedal is pushed further down. I wonder if you have experienced anything like this with a new clutch replacement on these tractors and if so any light you can shed will be most gratefully recieved. I realise that splitting the tractor is probably the answer and this is not a problem but I thought you might have some pointers on what to look out for. Many thanks again for a very informative and easy to follow DVD’. Firstly, you say that the noise starts as soon as you start to transfer any weight on the clutch pedal. This discounts any problem with the pilot bearing as anything wrong with this bearing would only become apparent when the clutch pedal is depressed fully to the bottom. I strongly suspect that the problem is either a faulty clutch release bearing or that the dowels are not there which locate between the engine back plate and the clutch housing. 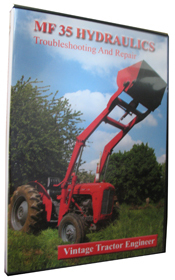 The bolts that hold the tractor together at his juncture are in fact smaller than the holes they locate through, as a result if the dowels are not present then the clutch fingers can become non-concentric with the release bearing (i.e. 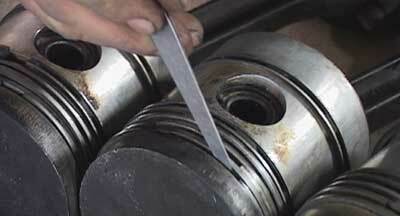 it is the dowels that hold the clutch concentric to the engine shaft). This situation can wear the ends of the fingers off in no time at all as the fingers shuffle on the release bearing. I would advise not to use the tractor until you have taken a look at it (in fact it could be too late and the ends of the fingers could already have worn off, we’ve seen it happen before). ‘Update on the 35 clutch with good and bad news I suppose. 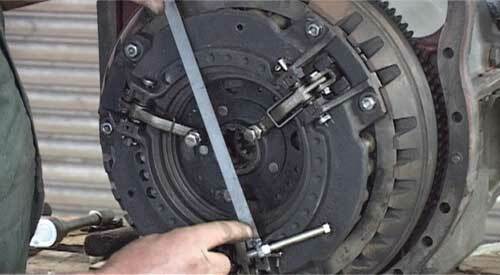 I can find no obvious problems with the clutch and thrust bearing set-up. The release bearing looks to be contacting the toggle set screws equally and having replaced the bearing the squeak is still audible, however I believe I originally thought that the squeak was present throughout the pedal travel but it definitely disappears when the clutch is down to the second stage ie. pedal right down. Well the clutch shouldn’t be excessively noisey. As you say, the pto adjusters should be set correctly, but you can check them. 88-92 thou is the spec, but they should all be as close as they can to each other. Just a few more thoughts. Could it be a squeek between the two input shafts? So what I mean is when clutch is depressed to first stage the gearbox input shaft will stop rotating but the pto shaft will still rotate. But when you depress the clutch to the bottom (end of second stage) then the pto input shaft will also stop rotating. Is there any chance the clutch assembly has been built up incorrectly at the factory? pto plates in wrong way round? Are the metal segments that go between the clutch cover and the flywheel in place, not been removed by a previous owner? Has anyone else experienced the same symptoms and got to the bottom of the problem? Just leave a comment below or Contact Us if you’ve got any ideas for Tom.